…the T stands for touring. 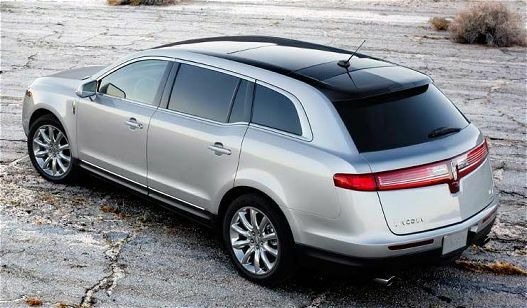 2010 Lincoln MKT: not popular. It has a “choice” of a 3.5 or 3.7 litre V6 engine. The smaller one is tuned for economy. And the engines drive the front wheels. Odd looking thing, isn’t it? The customers have been few. In its first full year on sale 7,435 buyers wrote a cheque. And in 2013 just over 6000 customers were found. Ford fondly imagine it is a competitor for the V8 Audi Q7. That’s what Motor Trend reported. Trying to second guess the American car market requires a diviner’s skill. Mercedes-Benz tried a similar tack with the unloved R-Class, which also proved a tough sell. Yet logic suggests this type of car would suit many US customers. After all, the wagon used to be a staple of the American suburban landscape. Jacked up and with drive to all four wheels, this most likely would have been an entirely different proposition. Isn´t this car an American equivalent of the Opel Signum? I had a look at the interior and it´s rather nice. While it is an odd looking car, I think it´s not awful, merely strange.